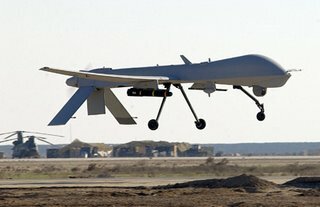 The US Air Force has four MQ-1 Predator unmanned aircraft on standby at their home at Creech Air Force Base, Nevada, waiting to assist when the need arises. An agreement with the Federal Aviation Administration (FAA) earlier this year cleared the way for unmanned planes to help out during emergencies. Immediately after hurricane Katrina, the FAA blocked the use of robot aircraft because there was no procedure to prevent them from interfering with commercial and other rescue aircraft. The new plan calls for the FAA to designate airspace during emergencies where the Predators can hunt. For example they could identify paths or altitudes where other aircraft would have to avoid the UAV's. The Predator is about the size of a private plane, 27 feet long with a 48 foot wingspan and 100 horsepower engine. It cruises at only 85 miles per hour. In a disaster the Predators would be loaded onto a freight aircraft or trucks and brought to an airport near the scene. They only need to be within 150 miles of the work zone. The take-off and landing are operated by pilots from remote stations at the location then control is handed to flight specialists at the base in Nevada. Predators can be used in a disaster for search operations, to survey damage and to make accurate maps of the disaster zone. The Predator also has an infrared camera for nighttime survellience. It can spot the heat of a person from 10,000 feet. They can also be armed with two laser-guided Hellfire anti-tank missiles - just in case.